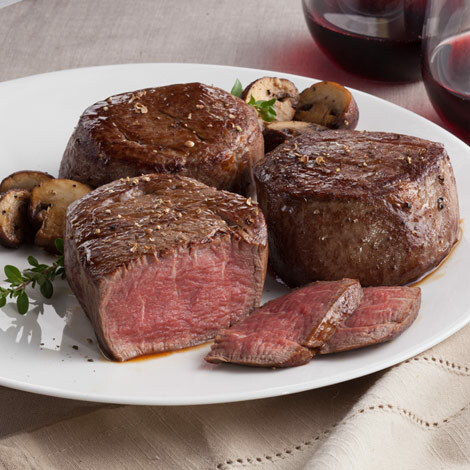 Cut from the most tender portion of beef, the tenderloin, these mouthwatering filets are specially trimmed for leanness and you have the Amana guarantee of superb quality. A gift of true love to yourself, family and friends. order a lot never had a bad product. Always high quality! Delicious on the grill and on the stovetop. We like our medium rare! Excellent product and quick receipt of order. BOTH LOOK GOOD. DID NOT USE YET. These steaks never disappoint. The quality is consistent and fantastic. I describe them as melting in my mouth. I am a loyal customer. Amana Response: Thank you, Lori! We appreciate your business! The Amana 6 oz. fillet tenderloins and 12 oz. smoked pork chops with bone in were surperb and prepared by Chefs who were impressed with the quality, texture, and flavor of the meats! And the 4 lb. 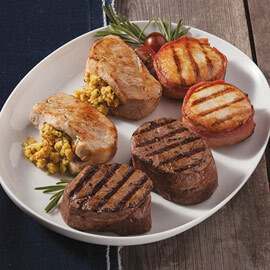 sampler package with 4 different flavors of the thick cut bacon were "icing on the cake"! Thank you for your excellent product and service as usual! The filets were packed well, as always. They cooked well and were extremely tender. I am always pleased with Amana Meats. Thanks to all the helpful people there. I placed another order today. Amana Response: Thank you, Bobbie! We appreciate your business! 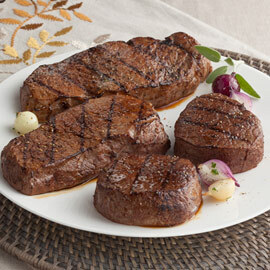 If your steaks are frozen, thaw in the refrigerator overnight, then bring them to room temperature before grilling. Heat your grill to medium high. 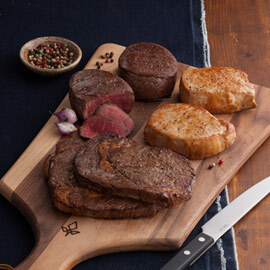 Brush the steaks on both sides with oil and season liberally with your favorite seasonings. Place the steaks on the grill and cook until slightly charred, 4 to 5 minutes. Turn the steaks over and continue to grill 3 to 5 minutes for medium-rare, 5 to 7 minutes for medium, or 8 to 10 minutes for medium-well. (We recommend using a meat thermometer to check internal temperatures: 135° for medium rare, 140° for medium, or 150° for well done.) Allow you steaks to rest 5-10 minutes before serving to reabsorb their juices. A pre-heated oven broiler may also be used, following the same basic guidelines as for grilling. *Note: Cooking times may vary per oven. When using an electric range, leave door ajar when broiling. With gas ranges, the door should remain closed. Tip: Try our All Natural Seasoning to add great flavor! 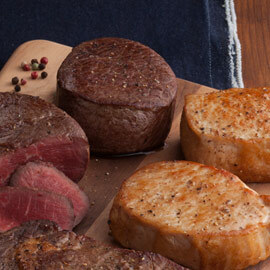 Steaks may be frozen in their original packaging for up to three months.